Is there a way to take a screenshot of an Android device and save it as an image file? You can press the Power button + the Volume Down button at the same time to take a screenshot. It will be saved to your gallery. Note: You need to keep the buttons pressed for around a second for this to work. This is to avoid the screenshot when this combination is accidentally pressed. If you're rooted: you can install an app called drocap2. This will let you shake your phone, wait on a timer, or click on a notification in your notification bar to take a screenshot and it'll save it to your phone. If you're not rooted: you can not run a screenshot app on your phone, period. You'll have to install the Android SDK on your computer, connect you phone via USB, and run a program called DDMS. This program is mainly used for developer debugging, but it has a screenshot utility under one of its menus. For a tutorial, see this page. Also, some constructor like Samsung have implemented this function on their phones (the buttons combination change from phone to phone, so search for yours). However some screens are protected and therefore can not be captured, e.g. some system settings dialogs. In the Galaxy S Froyo (Android 2.2) you can take screenshots by holding the back key and tapping the home button. Install the Android SDK on your computer, connect the phone and run DDMS from the terminal and then select Device > Screen Capture (or Ctrl+S) and a screenshot will be made. On a Samsung Galaxy S II, it's simultaneously pressing the Power+Home button. It's tricky though; 9 out of 10 times I can't get it. Obviously that's specific to that model of phone and not the Android OS. As far as I know, there isn't any native app built-in to the OS for all phones, it's too bad really. The following method also requires root, but may be better and easier if you need the screenshots while writing articles, app reviews or documentation. You do not need complex instructions or the Android SDK, and this works on all rooted devices. 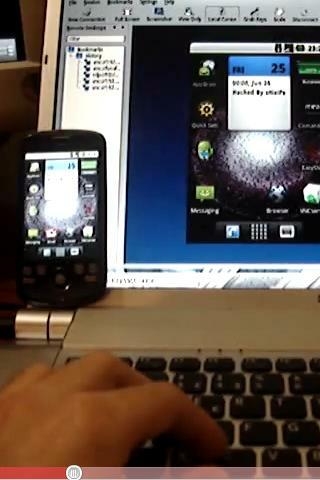 On the HTC EVO3D, you may press lock button and home button at same time to capture a screenshot. End result, is a PNG file called my_picture_of_android_home_screen.png is saved. Once rooted, I've liked working with Screenshot (Cyrket link). Set the timer, go to your application and wait; or set it to “Shake” mode, go to your application and shake it. Hard. And files show up in a screenshot folder. Happy day. I mean it. SHAKE IT HARD. Unless there's some trick to shaking and I'm doing it in the wrong direction, this is NOT a sensitive shaker. UPDATE: yeah, I'm using the timer option. Either the Incredible has a lousy shake sensor, the app is implementing it weirdly, or something else -- but shaking was just ridiculous. Would have been a nice interface, if that worked. (Variable) Timer to take screenshots works just fine! ShootMe does work for me on the Galaxy Tab (2.2), even if I did not root it and the ShootMe page says, that it works only for rooted devices. Your phone has to be rooted. If it is just search "screenshot" in the market for many options. For an unrooted phone you can use dolphin browser hd with an addon to get screen captures of a website. On the Samsung Galaxy Pocket GT-S53001, you can do it without any third party software. Go to the screen that you'd like to capture. Press and hold the Home button (center), then right after that, quickly press the Power button. If you wait too much it won't work and you'll just set the phone block. If that is done successfully, you should be able to hear the classic click and also see a white border appear in your screen. Go check your Gallery application. 1: It's possible that this works on all Android phones running Gingerbread, but I didn't try personally. When I got the 2.3.4 Upgrade on my Sony Ericsson Arc (from 2.3.3) holding down the power button brings up the "airplane mode/power off/silent" menu, and new to 2.3.4 is the presence of a "take screenshot" button as well. What happens next is, a screenshot will be taken. Then you will be able to adjust it before either accepting or discarding the screenshot. Some phones have the functionality built in, such as the previous mentioned Galaxy S. On the Droid Charge, hold the back button and press home. On most new LG Android phones, hold home and press power. Unfortunately, the only universal method is using the Android SDK to take screenshots with a computer. 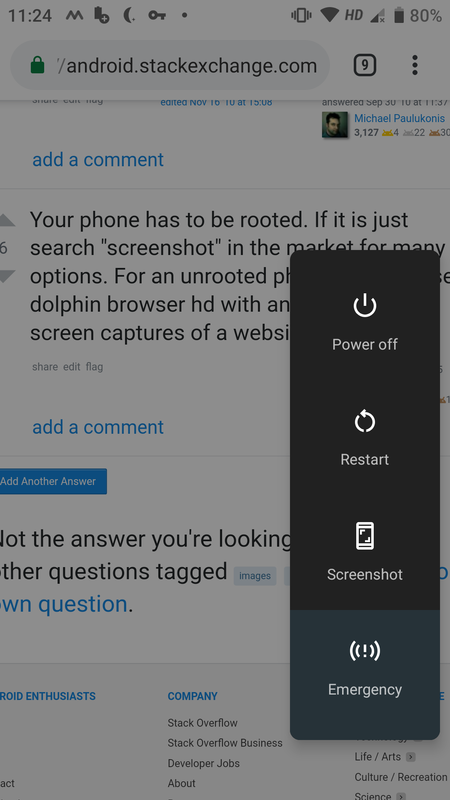 Rooting and using a screenshot app works on many devices, but sometimes not, and it's not the easiest way to take a screenshot. On Android 7.1.2, long press Home for OK Google and issue voice command Take Screenshot , it will respond with All right, taking a Screenshot, touch to continue. The least time consuming method for me is using keyboard through USB OTG. And then just press Print Screen. On the xperia z5, you simply hold lock button and that gives you the option of taking screenshot. Not the answer you're looking for? Browse other questions tagged images screenshots or ask your own question. How to print screen my application in android phone? How do I screenshot on my RCA Andriod 4.4.2 10" tablet? 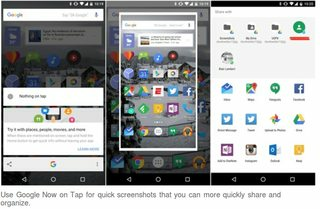 How to make a screenshot with Android 2.3.5? How can I take a screenshot on my Samsung Galaxy Fit? How can I screenshot the Nexus 7? How to take screenshot in NEXUS 5? Can you screen save on a Nexus 4? How do I take a screenshot on a Honeycomb tablet? How to take a screenshot on a Kindle Fire? How can I take a screenshot of a specific portion of my screen? launcher ex: how to take screenshot in? How can I take a high-resolution screenshot?